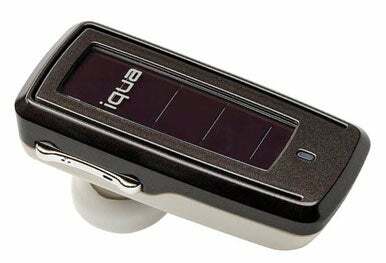 According to Iqua, the Sun can go longer without a charge than other Bluetooth sets due to its solar charging capabilities. When not in use, leave it on your car’s dashboard or desk and it’ll catch the sun’s rays and recharge. That’s great news for daytime drivers—bad news for vampires. Iqua also showed off the Vizor Sun which is a car kit device that attaches to your car’s visor and allows you to control your phone conversations via Bluetooth technology. Instead of reaching for your cellphone in a moving car—kind of a no-no from a safe-driving standpoint—you can simply click on the visor above you to end a call, increase volume, redial, and so on. Like its headset cousin, the Vizor Sun recharges by direct exposure to sunlight.